Bystro Restaurant Grill is the absolute best restaurant in Taichung. [EDIT: was the best – they are now gone] For me, it’s not just the best restaurant in Taichung, or even Taiwan: it is my favorite restaurant in the world. And I have my reasons. The husband/wife team of Patrick and Anita really have it figured out. First and foremost, they make the most fantastic burger I have ever had. The Blue Demon: a grilled 180g (6.3oz) hand-pressed sirloin patty that you barely have to chew…topped with bleu cheese, smoked bacon, lettuce, tomato, and onion…served with hot sauce and (upon request) barbecue sauce…on an in-house-made bun…served with shoestring fries and cole slaw…for only TW$300 (US$10). I can not over-sell this burger – it’s that good. Now, you’ll notice I have a drink there. That is one of Anita’s specialties, the hard-to-find and highly-coveted-by-me Tequila Sour. It’s basically an extra-sour fresh-squeezed lemonade with tequila in it. It’s my all-time favorite drink, and just like nobody makes a burger like Patrick, nobody makes a Tequila Sour like Anita. She literally squeezes the lemons right in front of you when she makes the drink. No drink leaves the bar without her extracting a teaspoonful and taste-testing it, in an effort to constantly improve her craft. The fact that they have a buy-one-get-one-free happy hour every day from 4pm-7pm doesn’t hurt, either. Instead of paying TW$180 (US$6) for that drink, I’m paying half that, which is an absolute steal. The crowd is a good mix of native Taiwanese and foreign businessmen. Local expats certainly show up, but with their sense of what they feel prices for a meal/drink should be, it’s often cost-prohibitive for them. But for anyone who’s lived “back in The World” during the last decade, a ten-dollar burger that looks/tastes like that is one of the best deals there is. Fish and chips will run you TW$260 (US$9). Most of the pizza and pasta dishes will cost around the same, give or take TW$30 (US$1). The best value on the menu, though, is most expensive item: the ribeye, which will run you TW$880 (US$30). Service is extremely important to Bystro. While Patrick runs the kitchen and Anita runs the service-end, they do their share of cross-training. You’ll often find Patrick coming out of the kitchen to observe the restaurant, a trait virtually never seen in a chef. Anita, as well, bakes bread, pies, tarts, and filled-to-order cannoli (because there’s nothing worse than soggy cannoli). They work hard to make sure their customers have the very best dining experience possible. Check out Bystro’s website or you can go to their Facebook page. They’re open from 4pm-12am every day except Tuesday. Their address is 台中市精誠路50巷27號 – just copy-and-paste it into Google or print it out and hand it to a taxi driver. If you’re looking for a reservation or just more information, their phone number is 04-2327-1563. Bystro Taiwan: the best restaurant in Taichung. 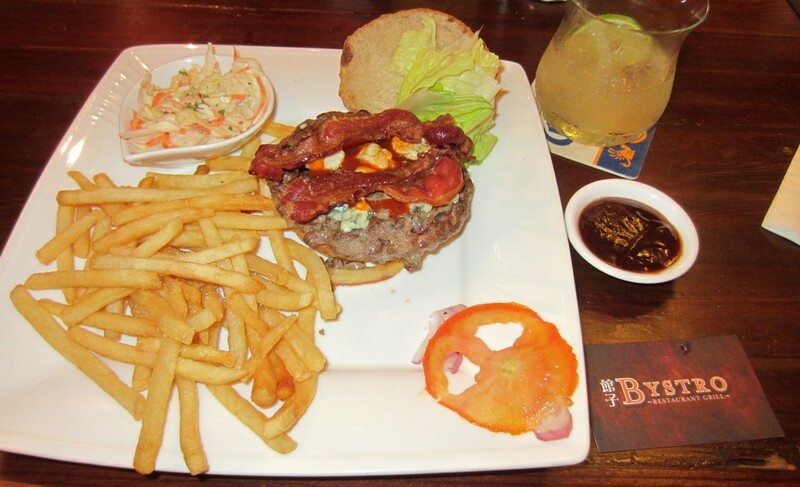 This entry was posted in Taiwan Writings and tagged american, best, best burger, best burger in taichung, best hamburger, best hamburger in taichung, best restaurant in taichung, bistro, burger, bystro, bystro restaurant grill, bystro taiwan, chef, dining, expat, expatriate, expatriates, expats, food, hamburger, happy hour, italian, restaurant, restaurant review, review, taichung, taiwan, taiwanese. so jealous 🙂 It looks too good for only 300NT. The place is nice. Does 300NT include the french Fries? Yes, it does. Cole slaw, too. And, if you go at Happy Hour, it’s two tequila sours for $180. Great deal! I am dying of jealous here 🙂 I think if they add a fried egg in this burger, that would be perfect. Well, I don’t know because I love fried eggs in sandwiches 🙂 I will take a note of this restaurant. So, I will have the chance to go there when I visit Taichung. I have never been in Taichung. Is there any cool stationery store there? I am very obsessed with cute things, school supplies, cards. I know I can find here. But, when I was in Kaohsiung, I would go everyday to see if I could find anything new.Every stationery stores sell something different. If you know the addresses of those stores. Could you give me the address? I can’t find anything online. Most of those stores don’t have websites. Walked past did not go in. I will next time i am in Taichung Feb-March2014.